Spent a few hours driving around South Florida, revisiting a few areas previously covered to see construction progress on a number of projects. The main changes throughout Broward and the Miami area involve adding high occupancy toll (HO/T) lanes and the conversion of toll roads to All Electronic Tolling (AET). Coinciding with the toll projects are additions of flyovers at some exits and a complete overhaul at others. 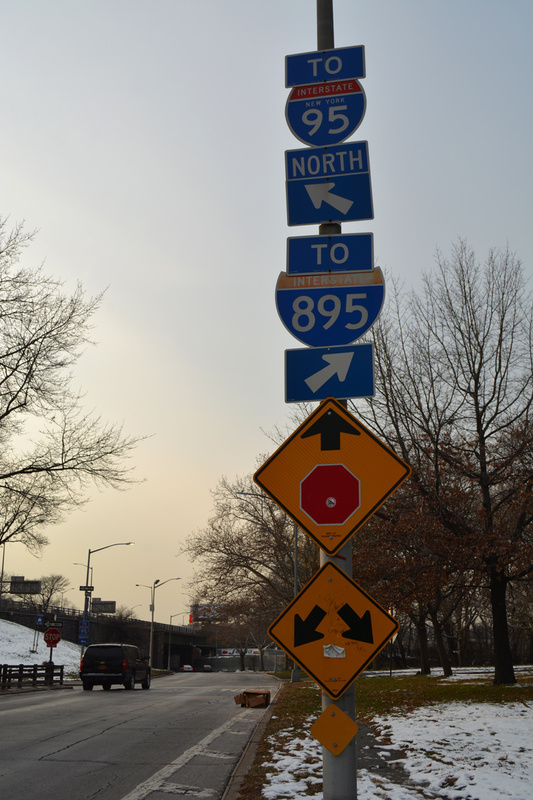 Most of the signs for the Interstate 75 southbound ramps to SR 869 Toll north and I-595 east were replaced since 2014. 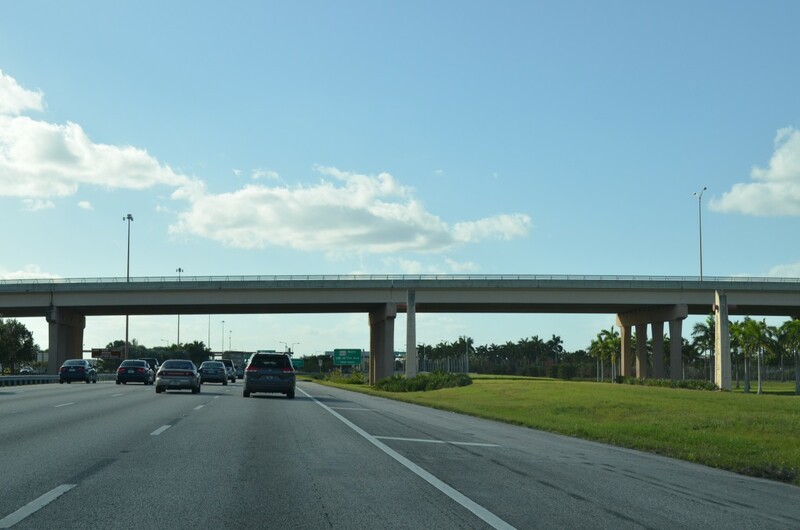 These reflect the change of the Sawgrass Expressway to AET. Construction is well underway involving the addition of Express Toll Lanes for Interstate 75 between Weston (I-595) and Hialeah (SR 826). 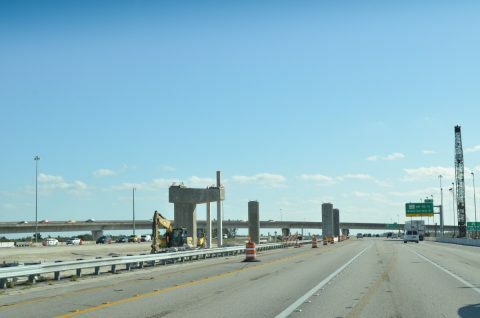 Split into five segments, with the southern segment coupled with the Palmetto Express project (FDOT District 6), work expands the southernmost 15 miles. 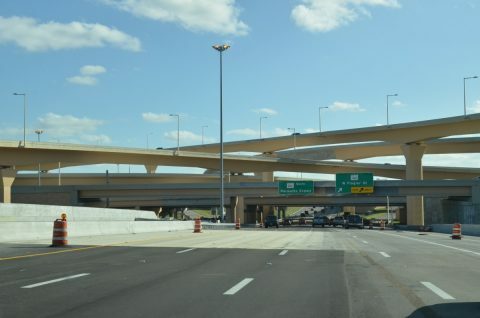 Work started on the entire project in early 2014, with an expected completion on Segment 5 (I-595 to Griffin Road) by summer 2017, and subsequent sections southward from Summer 2018 to Spring 2019. 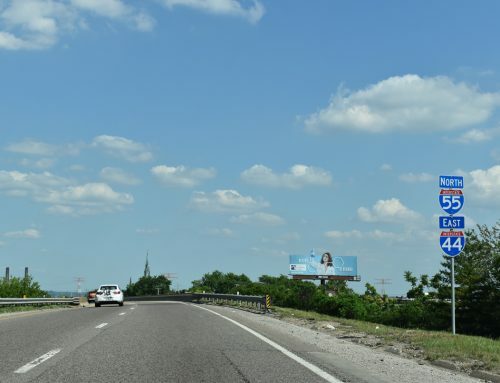 Although still well over a year away from completion, signs for Segment E of the I-75 Express Lanes are partially in place, including this overhead for the southbound lane beginning. Work at the Homestead Extension of Florida’s Turnpike (HEFT) includes 15 bridges that not only will join the I-75 Express lanes with the turnpike mainline, but also include new movements between the two routes. This includes adding access from the Turnpike south to both directions of I-75 and from I-75 south to the HEFT north. Presently a simple wye interchange provides limited access between the two highways. 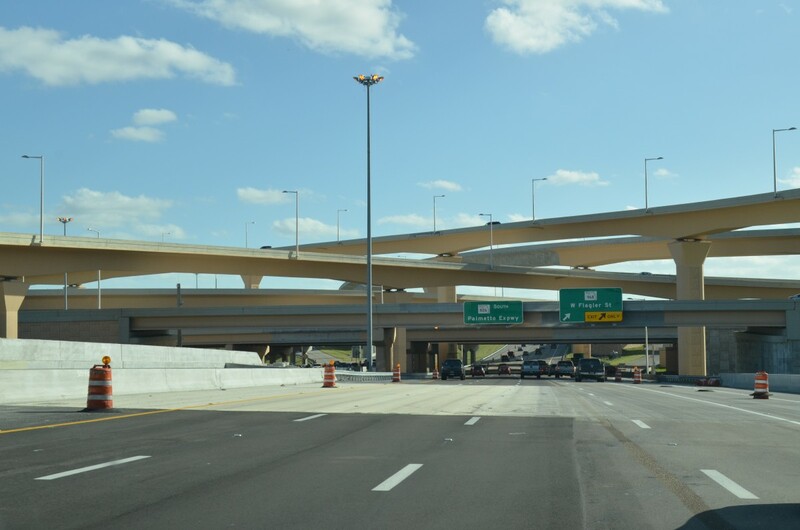 Bridge supports appear within the median of I-75 for the future Express lane flyovers leading to and from the HEFT. 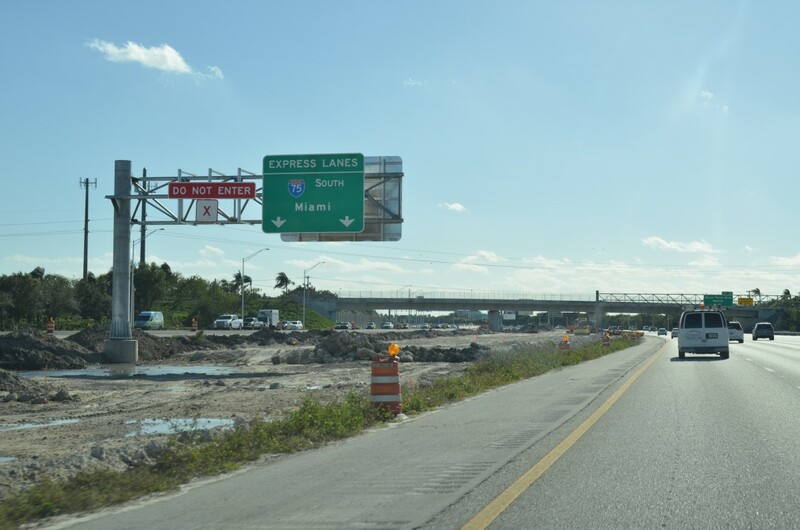 Associated construction continues the HOT lane addition along the Palmetto Expressway southward from Interstate 75 at Hialeah to SR 836 (Dolphin Expressway) at Doral. 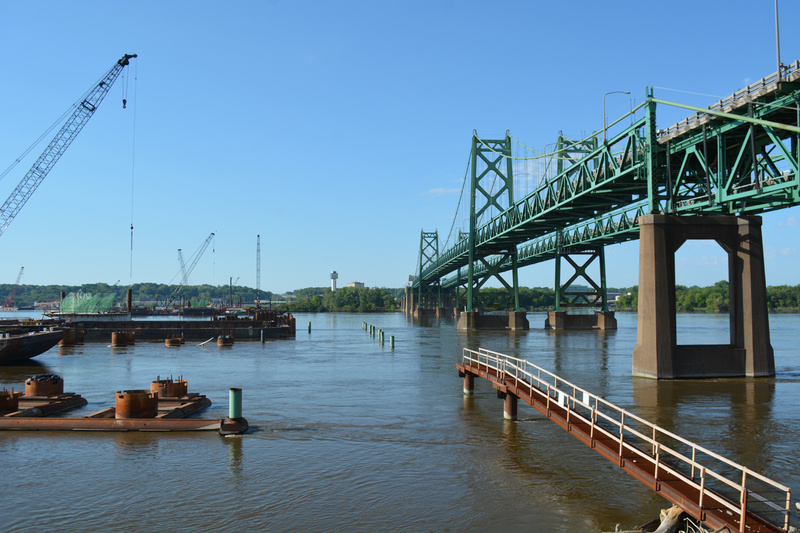 This work commenced on April 1, 2014 and runs through the end of fall 2017. A signature element to this road work was the upgrade of the exchange between SR 826 and 836 from a directional cloverleaf to a high-speed stack interchange. 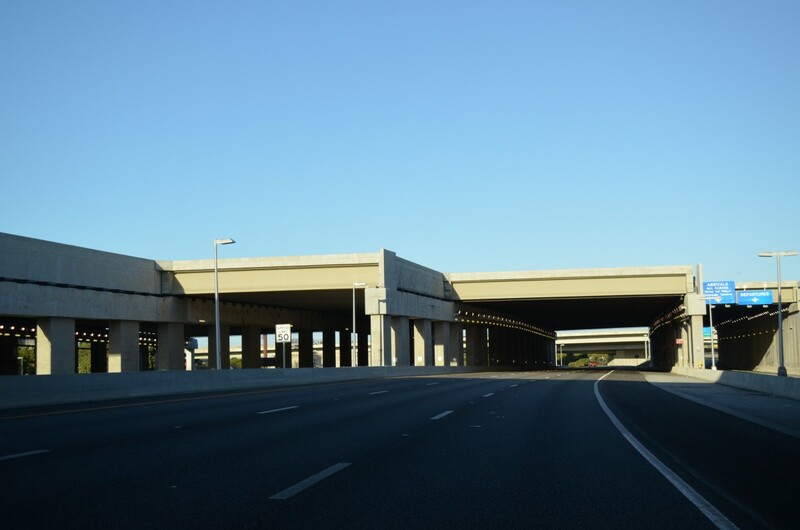 The mostly completed stack interchange joining the Palmetto and Dolphin Expressways. A high speed flyover now shuttles motorists from FL 826 (Palmetto Expressway) north onto the Dolphin Expressway west to Doral. As part of the conversion of the Dolphin Expressway to two-way tolling, cash tolling operations ceased as the road switched to AET using Sunpass and toll by plate options. 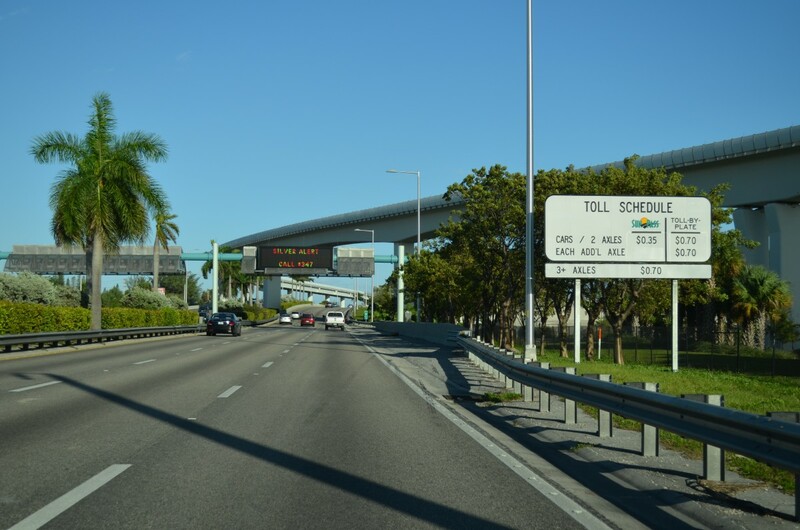 This changed on November 10, 2014, when tolls commenced on both directions of SR 836 and along parallel SR 112 (Airport Expressway). 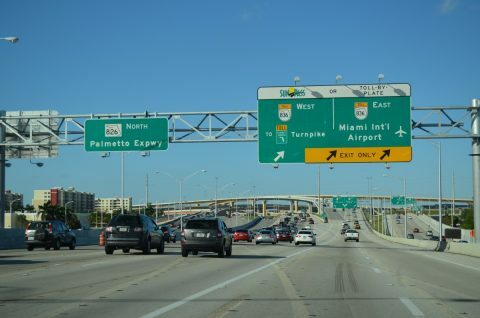 Additional funding derived from the tolling pays for the overall improvements to the Dolphin Expressway. 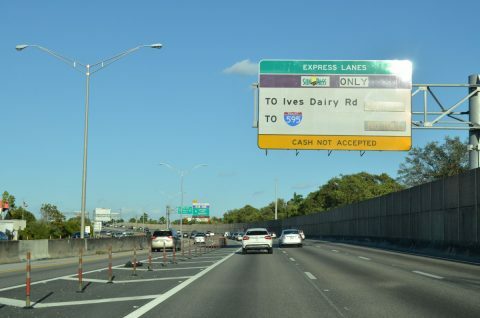 The grassy area is where a two-lane off-ramp departed for the conventional toll plaza along the Dolphin Expressway westbound at NW 97th Avenue. The plaza sits idle nearby now. 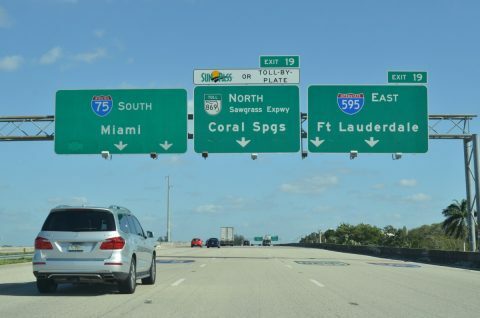 Having not documented the Airport Expressway since 2006, we worked an eastbound shoot through the toll road from Miami International Airport (MIA) east to the transition into Interstate 195. 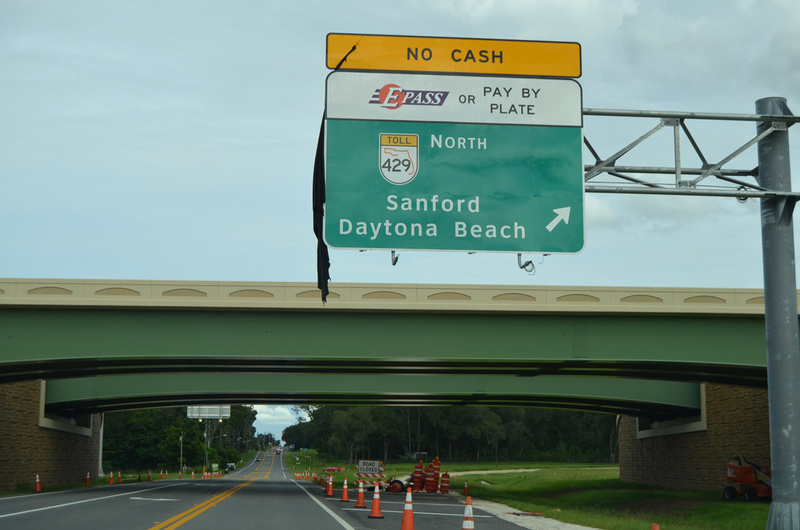 Tolls along SR 112 were originally collected in the eastbound direction at a plaza located just east of NW 17th Avenue. 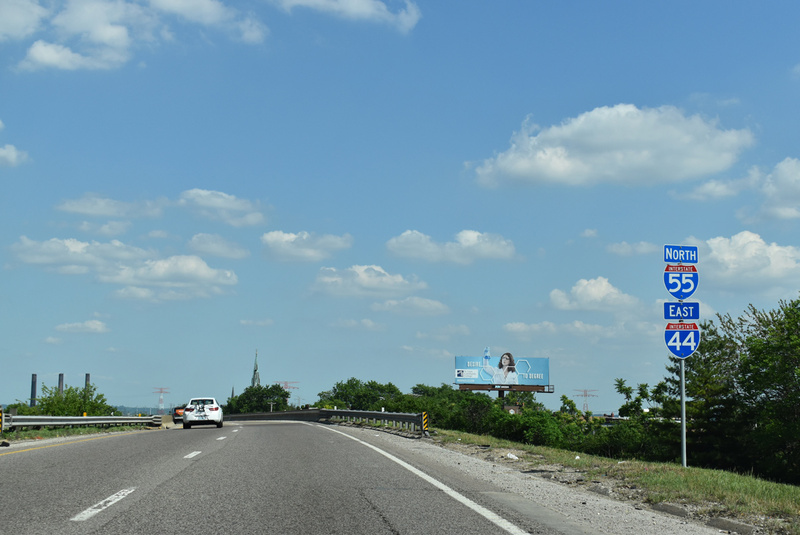 A pair of mainline AET gantries now operate along the expressway. The first toll collection point along SR 112 east coincides with a dynamic message board preceding the Metrorail (Orange Line) flyover. The second toll collection point along SR 112 east is located near NW 14th Avenue. 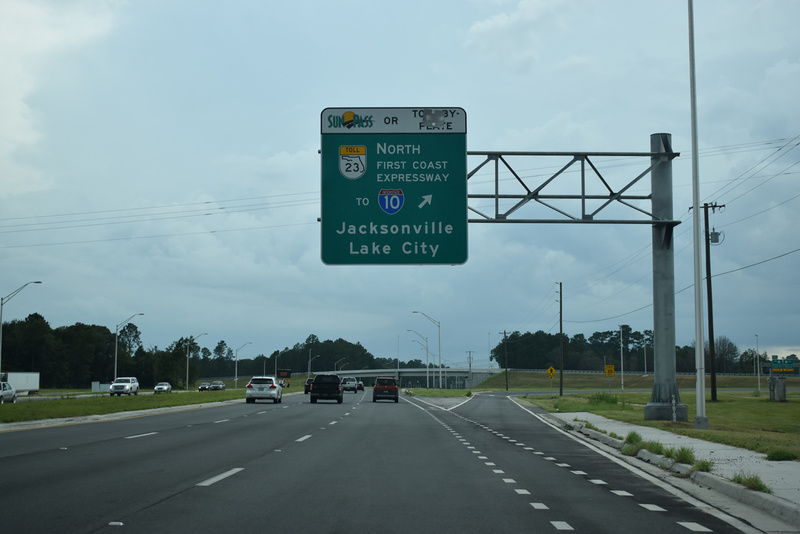 SR 112 transitions to Interstate 195 just east of the gantry. 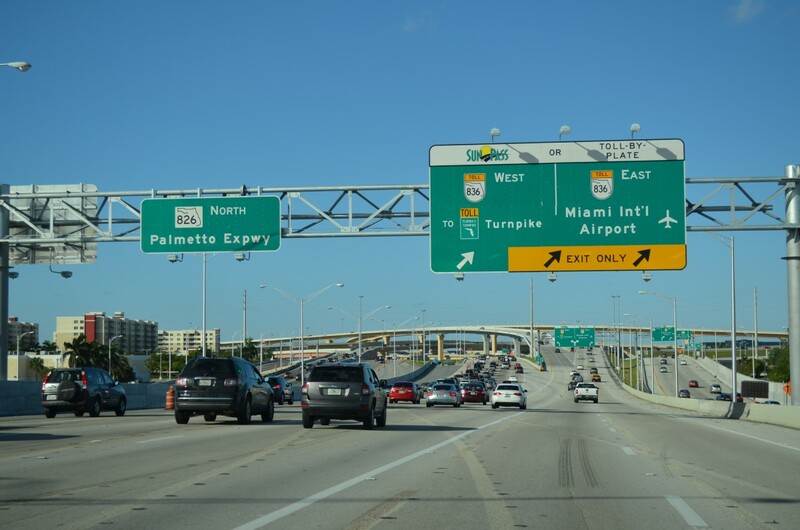 The I-95 Express Lanes ended at the Golden Glades Interchange on our last visit to the Miami area. Work on extending them northward into Broward was ongoing as well. 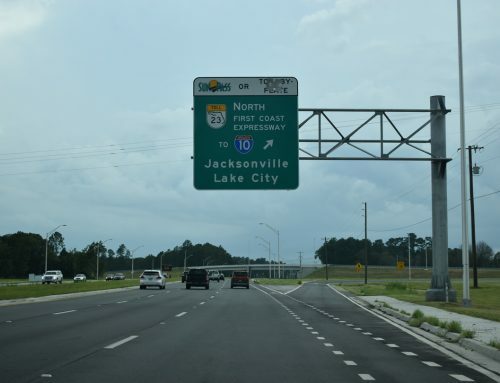 Returning north along Interstate 95, signs indicated that the initial extension of the HOT lanes was open with no tolls charged. Final paving and plastic poll installation work, from Hallandale Beach Boulevard northward to Broward Boulevard, runs through March of 2016. 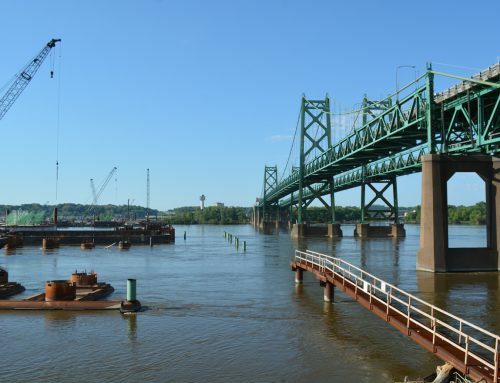 Upon completion, tolls will be implemented. 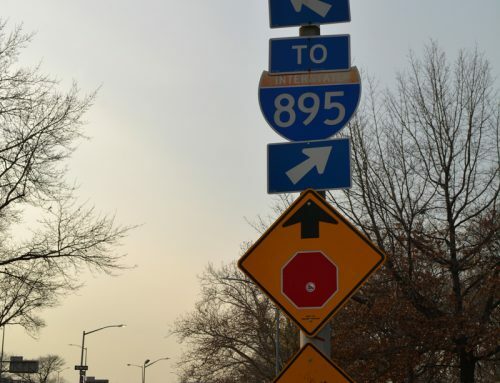 Also as part of the Express lane project, all signs along Interstate 95 were replaced and no longer include illumination. Nearing the ingress point for the 95 Express toll lanes along I-95 north after the Golden Glades Interchange. The lanes are open toll free at this time as they are incomplete. 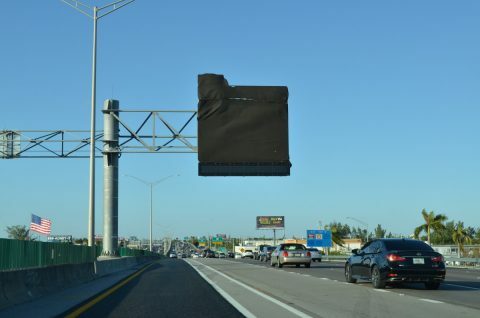 Signs for the 95 Express lane ingress point after Hallandale Beach Boulevard (SR 858) remain tarped. 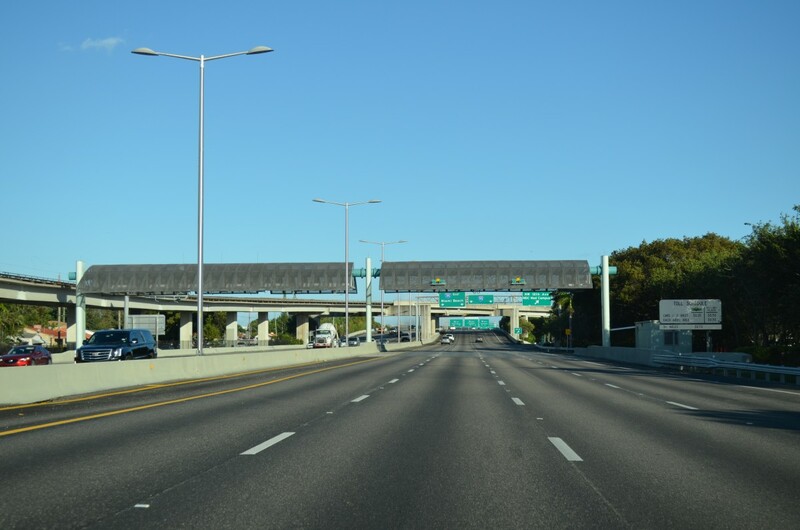 Once plastic pole installation is finished, tolls will ensue as the HOT lanes extend north to I-595. The last stop of the afternoon took us to the east end of Interstate 595, where the flyover (Eller Drive Overpass) linking the freeway with Port Everglades was completed in spring 2015 as is adjacent work to extend the Fort Lauderdale International Airport runways across U.S. 1.1 The two and a half year, $826 million airport project included a new south runway extending 8,000 feet east across U.S. 1, Perimeter Road, and a Florida East Coast Railway line. 12 tunnels were incorporated into the design. The new runway commenced operations on September 18, 2014. U.S. 1 emerges between the two tunnels carrying the south runways of FLL Airport. The spans travel 65 feet above the roadway mainline. Algumas vias ainda precisam de reformas.